For over 40 years Armantrout Studio has offered a variety of art and art-related classes. In May, 2019, Armantrout Studio will relocate to Santa Fe, New Mexico. Linda has been gratified to be able pass on the teachings of Edith Niblo, John Lencicki, and Chuck Ceraso. She has enjoyed the company of her students and wishes them all the best in their artistic journeys. To access the valuable material that Linda passed on click here. The final class at CFA Gallery, 916 Main Street in Louisville, Colorado will be January 5, 2019. "Each time I teach this material, I understand it on a deeper level. I realize now that when I received the lessons from Edith Niblo, she was absolutely current. She shared the most forward teachings of great teachers like Hans Hofmann. Hofmann taught about “push/pull” and the principles of organizing space that could lead either to Abstract Expressionism or figurative art. Most importantly, this material will lead you to find your own path as an artist. It is an honor to pass along Edith’s basic philosophy of art and life. Your art process and your spiritual process are intertwined. As you work your way through the lessons, you will understand how you can use the elements and apply the principles of design to make strong personal visual statements." —Linda Armantrout on "The Art Process." if you are out of state and wish to accelerate your Art Process online at your convenience read Online classes below. 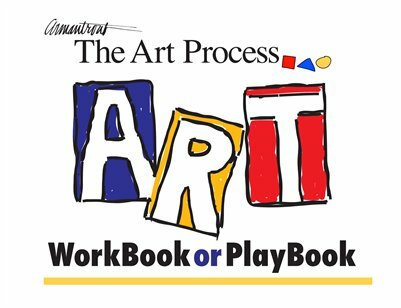 Published in 2014 The Art Process WorkBook or PlayBook. Click below. Access to rich material to support your artistic journey. Please see a preview by clicking below on the MagCloud badge. It is available as a real book on paper and is wire bound to lay flat while you do the lessons, or if you like, buy a digital version, or both. Click on the Cover below to preview and/or purchase the book. Learn to support your ideas with good composition and management of the elements and principles of design. Learn to make color choices based on a 12 hue color wheel. Five students are returning for this ongoing class. Call 303-664-0086 if you want to join us. 3. Compositional (arrangement in the frame). 4. How to manipulate the Elements and apply the Princples to the Elements. When: 10:00 am to 12:30 pm. First and Third Saturdays 2017 and 2018. Cost: $130.00 due first Class of the month, each class is $70.00 if bought singularly. Call 303-664-0086 now to reserve a seat. Basic Design 1-Relationships within the frame Learn the elements and principles of design. Learn to support content in your 2-D work. Learn to work in a sketchbook to develop ideas. This course will add impact to your artwork in any medium. Course follows the lessons in The Art Process Workbook (see above). Basic Design 1 will benefit beginning and advanced artists. Reference the WorkBook above to preview the class. Call Linda at 303-664-0086 to talk about your process and what you need.